Acting in the interest of the United States, Tennessee and North Carolina governments, General Andrew Jackson and Isaac Shelby, as commissioners, made a treaty of cession for the western section of Tennessee and western Kentucky, with the traditional Indian owners, the Chickasaws, October 19, 1818. The treaty of cession was accepted by the national government and ratified when President James Monroe signed it on January 7, 1819. (TENNESSEE LAND LAWS, edited by Henry D. Whitney, 1891, page 486) The legislature of Tennessee convened in October 1819 and accepted the cession and expressed its intention of honoring the old North Carolina grants made heretofore in the newly-acquired territory and that it would also establish land offices so that the land could be speedily and effectively distributed. The first settlers in what became Madison County started to trek into the area in 1819, even before the lands officially were set for sale the next year. There were sufficient settlers to petition the state legislature for the forming of counties from the new territory. The several petitions addressed to the state legislature from the settlers of this area have been preserved and are kept in the Tennessee State Library and Archives in Nashville. The present writer has taken their names directly from the original petitions as arranged for him by the clerk handling these papers. Most of the settlers who signed the petitions lived within what became Madison County. 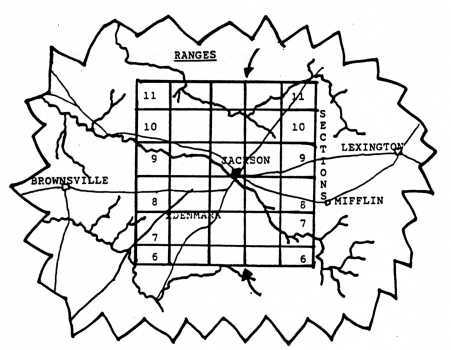 However, those persons living in Range Three of the Ninth Surveyor District, sections 6-11, lived in that area which became Henderson County on November 16, 1821. Madison County, as drawn with its range and section lines and published on the Mathew Rhea "Map of Tennessee, "1832 (and engraved by Tanner, Dawson and Knight, Philadelphia, Pa.), is shown on the next page (with curved arrows drawn to mark the division lines of the 9th Surveyor District (the eastern part of the county) from the 10th Surveyor District (more central and western part of the county). To the honourable the members of the General Assembly of the State of Tennessee. We the citizens of the western district in the state aforesaid residing on the waters of the Forked Deer River, beg leave to represent to your honourable body, that we labour under many inconveniences arising from the unorganized state of our country. We your petitioners therefore pray that you grant us relief by designating and laying off this section of country into counties having their constitutional limits or as near so as circumstances will permit, and in order more permanently to establish the lines of the same, your honourable body will see the propriety of circumscribing the Country of Stewart, Humphreys, Perry and Hardin to these constitutional limits or as near as circumstances will justify, your petitioners recommend the adoption of the above plan with a full persuation of its constitionality and that it will have a tendency to tranquilize the present as well as the future inhabitants of this country. Your petitioners further pray your honourable body to pass the necessary laws for the organization of a county that may include your petitioners who principally reside in the north west and north east corner of the north & south principal Surveyors District and in the Sections & Ranges as follows (to wit). And for the due administration of justice in said county, we further pray your honorable body to appoint the following gentlemen Justices of the Peace in and for said county (to wit), James Trousdale, Nelson J. Hess, 10th District 10th Sec. & 1 Range. B. G. Stewart, 10th Sec. 1st Range, 9th District. William Atchison, Abner Browne & James Thompson, 11th Sec., 2nd Range & 9th District. James A. McClary, 11th Sec., 3d Range & 9th District. William Harris, 9th Sec., 3rd Range & 10th District. Thomas Fite, 2nd Range 2nd Sec. & 13th District. John Rutherford at the key corner. John Bell, 3rd Range, 10th Sec. & 9th District. Samuel Taylor, 11th Sec. 1st Range & 9th District. To the hon'ble the General Assembly of the State of Tennessee, the petition of sundrie inhabitants west of Tennessee River humbly sheweth, that we reside in the 7th, 8th, 9th Sections of the First, Second and Third Ranges in the 9th & 10th Surveyors Districts. That the population of the free male inhabitants in those sections entitle us to be encorporated and organized into a county with the dew administration of justice agreeable to the constitution of this state and should we be included within the limits of any county laid out agreeable to a petition, exhibited to your honorable body for laying out the whole section of our country into counties having their constitutional limits. We pray you in your wisdom to encorporate and organize us into a county by defining our limits by the appointment /sic/ magistrates and by all other legal means which will give us a fair representation both in the general & state government. To the honorable the General Assembly. We your petitioners residing on the waters of the Forked Deer humbly sheweth, that we reside in the 7, 8, 9, 10 & 11 Sections in the 1st, 2nd & 3rd Ranges in the 9th & 10th Surveyors Districts west of the Tennessee River and that should we be included in any one county to be laid out by sd. General /Assembly/ & impartial plan represented to your hon'ble body for laying out the whole western district with counties having their constitutional limits, we pray to be incorporated and organized into a county as so much of our territory of sections as may be included in such county and thereby granting to us such relief as in your wisdom you may deem necessary as will leave us no longer in want of the due administration of justice & your petitioners will ever pray.